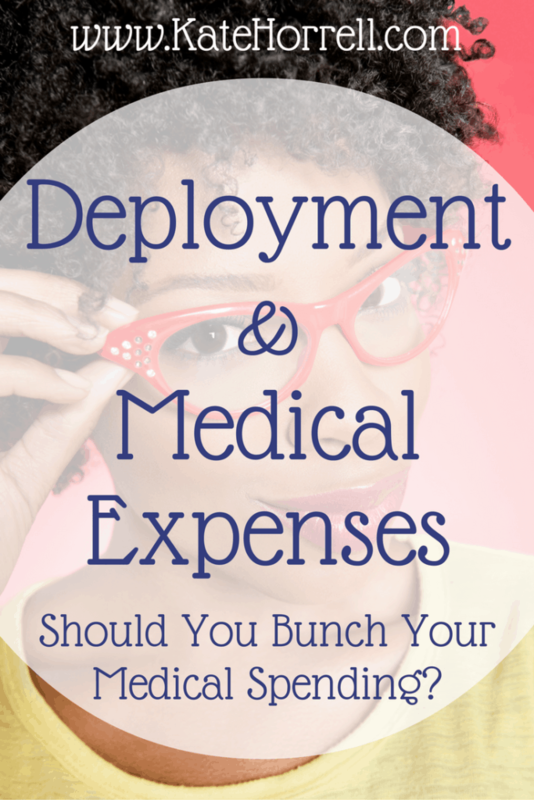 Deployment and Medical Expenses – Should You Bunch Your Medical Spending? It’s December, and that means endless commercials reminding people to use their flexible spending account dollars before the end of the year. The Department of Defense, unfortunately, still hasn’t implemented the flexible spending account that they were directed to create in the 2010 Defense Authorization Bill. If we don’t have flexible spending accounts, why should military families care about bunching their medical expenses before (or after) the end of the tax year? Because, in certain specific situations, military families may be eligible to deduct a portion of their medical expenses from their income taxes. When Can I Deduct Medical Expenses? You itemize your income tax deductions. For most people, the line between itemizing or taking the standard deduction is crossed if they own a house in a somewhat expensive area. For example, we live outside DC, and we own a house with a big mortgage. We itemize our deductions. It’s this second part that is key to understand. You can deduct any eligible medical expenses that exceed 10% of your AGI. For example, if your AGI is 30,000 per year, then you can deduct any portion of expenses that exceed $3000 per year. Thankfully, under normal circumstances, that means that very few people get to deduct any medical expenses. Military families, with Tricare’s $1,000 catastrophic cap, and generous dental coverage, are especially unlikely to spend more than 10% of their yearly salary on medical expenses. The exception happens when the military member is deployed to a tax-exempt combat zone. If much (or all) of the service member’s income is tax-exempt, then your AGI will be lower. If the service member is the only income, and they’re deployed all year, your AGI might be zero. Ten percent of a small income is a small number, and 10% of no taxable income is zero. In these cases, it becomes much more likely that you’ll be able to deduct medical expenses. For example, let’s say you have the same base salary of $30,000 per year, but you’re in a designated tax-free area for seven months of the year. Your AGI (assuming no other income or adjustments) would now be $17,500. Ten percent of that is $1,750 – still a fairly big number, but you could absolutely spend that on health expenses once you add up dental policy premiums ($426.16 per year for a family in 2016), a couple of pairs of eye glasses, and some dental work. If you’re deployed the whole year, you might be able to deduct every bit of your medical expenses. The point is: have you already reached the point where you can deduct medical expenses? If the answer is yes, then you should see if you can move up any expenses for next year, so they can also be deducted. Using the example above, let’s say that already have more than $1,750 in medical expenses for the year. Could you refill your contact lens prescription before the end of the year? Could you squeeze in the payment on orthodontics? Is this the right time to deal with that dental situation you’ve been avoiding? The same logic applies if you will have a low AGI next year – what expenses can you defer until January? Would your chiropractor allow you to pay for this month’s visit at your next visit? Could you put off your eye exam by a few weeks? Can you defer those new eyeglasses until the new year? If you have, or will be, spending some time in a designated tax-free area, planning your medical expenses can result in a huge savings. I am really sad when I think about how much money I wasted because I didn’t know the rules earlier in our military journey. Learn from my mistakes! As always, I am not a tax professional and I do not know anything about you or your tax situation. Do your own research and consult with your tax professional to see how these rules apply to your specific circumstances.